Chief of the General Staff of Iran’s Armed Forces Major General Mohammad Bagheri paid an official visit to Baku on January 16 at the invitation of the Azerbaijani Defense Minister Colonel-General Zakir Hasanov, accompanied by a high-ranking military delegation. At first, the parties held a one-on-one meeting, after which an expanded meeting was held. A meeting of both countries' delegations took place at the Ministry of Defense. Assessing Bagheri visit to Azerbaijan as an indicator of friendly relations between the countries, the Azerbaijani Minister of Defense emphasized the merits of National Leader of the Azerbaijani People Heydar Aliyev and President Ilham Aliyev in establishing and strengthening mutual trust in these relations. Speaking about the military-political situation in the region, Hasanov brought to the attention of the guest that the Armenia-Azerbaijan Nagorno-Karabakh conflict continues to be a serious threat to stability in the region. The minister also expressed gratitude to the Iranian side for its efforts aimed at resolving the conflict within the framework of Azerbaijani territorial integrity and sovereignty. Noting that religious, historical, cultural ties between the two countries are based on good friendly traditions, Bagheri said that, like in many other areas, there is also a wide potential for cooperation between the two countries in the military sphere. He added that Iran supports the territorial integrity and fair position of Azerbaijan in resolving the conflict and will provide full support to Azerbaijan. Bagheri said that the purpose of the visit is the expansion of military and defense cooperation between Iran and Azerbaijan. 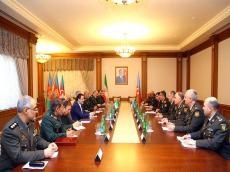 During the meeting, the parties exchanged views on the prospects for the development of cooperation in the military, military-technical, military-medical and military-educational fields, countering terrorism, regional security, organizing mutual visits of expert groups, as well as other issues of mutual interest. Following the meeting, a protocol was signed. Bagheri’s visit is the first visit of a chief of the General Staff of Iran to Azerbaijan. Azerbaijan and Iran are two neighboring countries that have had long-standing relations, and today they continue to improve mutual ties. In this context, the two states have established the Joint Working Group on Military Cooperation between the Defense Ministries of the two counties and Armed Forces Logistics, and its first meeting was held in Baku on October 24. Azerbaijan and Iran have had fruitful diplomatic relations since 1918. Iran recognized Azerbaijan's independence in 1991, and diplomatic relations between the two countries were established in 1992. The Armed Forces of the two neighboring countries have many times showed their great skills at various international military exercises. Today it is obvious that the military cooperation between Azerbaijan and Iran is of great importance, as it will improve the state of the two countries' Armed Forces, their combat readiness, as well as the security in the region.